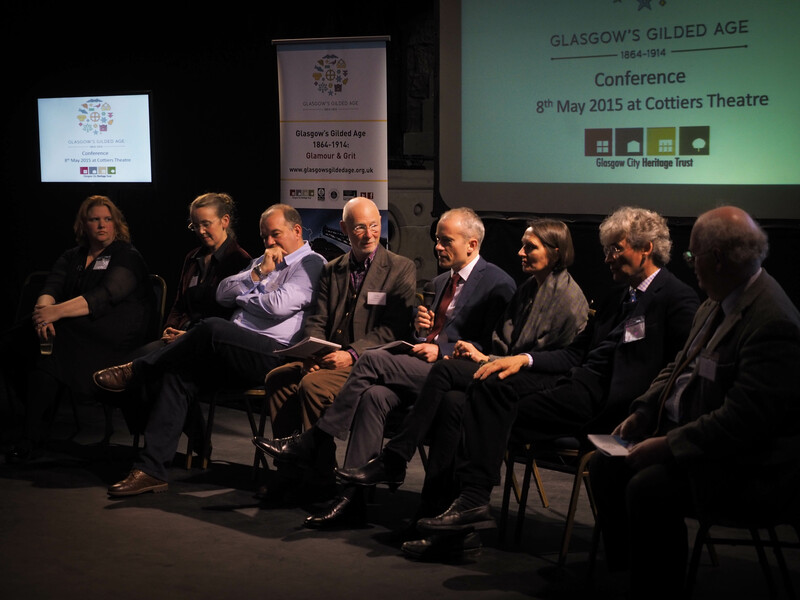 Glasgow’s Gilded Age: Conference No.1 – History. Heritage. Hilarity. Karen has already posted some snaps from the day (quite rightly from her bed), and said thank you to all involved, but after a nice long nap and scones with jam and clotted cream I am writing this more in-depth post about the Big Day. It all kicked off at 8am for the History Girls as we got to Cottiers to be faced with the fact that the day had arrived, this was actually happening, in one hours time. And happen it did! 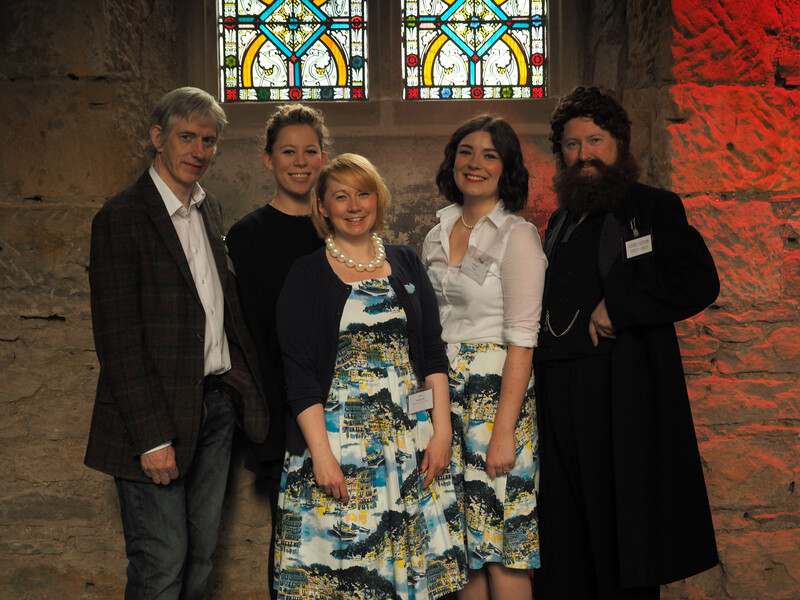 Frome L-R: David Robertson, Director of the four Acres Charitable Trust, Erin Walter, Intern at Glasgow City Heritage Trust, Karen Mailley-Watt, History Girl 1, Rachael Purse, History Girl 2, and of course Daniel Cottier (deceased) played by actor Iain Wotherspoon. Taken in Cottiers by Teresa Dickson at Glance, Observe, Capture Photography. Image copyright of Glasgow City Heritage Trust. 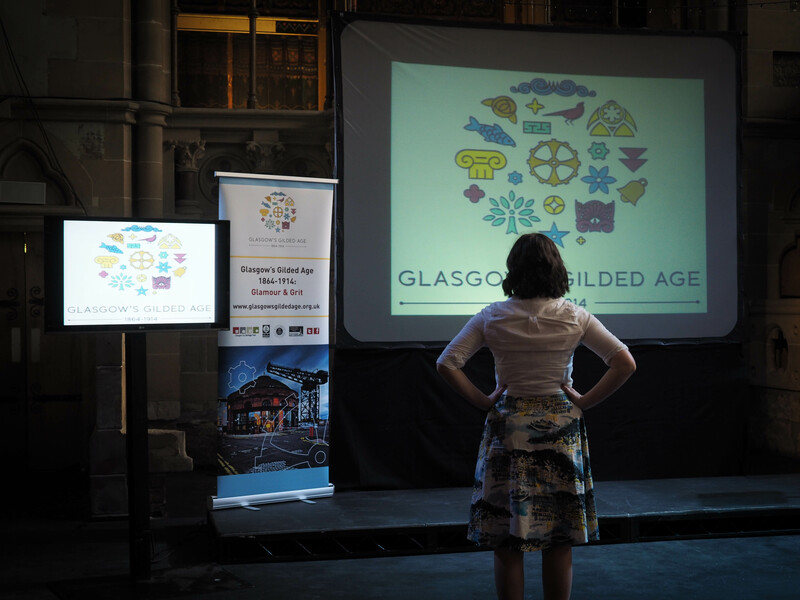 After a flurry of activity, involving the help of the fantastic Cottiers Tech Team; Pete, Simon and Fraser and the Event Staff, and Erin Walter, an intern at Glasgow City Heritage Trust, and our glamorous photographer Teresa Dickson, we were ready to go. Daniel Cottier himself, or rather the wonderfully good sport, actor, and lover of Glasgow’s history, Iain Wotherspoon, was on hand to greet attendees as Erin managed the stressful job of registering them all perfectly, and remained sunny and helpful throughout the long day, what a gem! Preparing for the arrival of our attendees… Taken by Teresa Dickson at Glance, Observe, Capture Photography. Image copyright of Glasgow City Heritage Trust. After a quick round of teas and coffees and some fab homemade tablet, Karen and I welcomed our wonderful speakers and got their presentations ready to go. A huge thank you needs to be siad at this point to these glorious and generous humans who shared their time and knowledge with us on the day; Ranald MacInnes, Prof. John Hume, Dr. David Mitchell, Emily Malcolm, Dr. Robyne Erica Calvert, Helena Britt, Dr. Peter Burman, Ian Gow, Dr. Sally Rush, Max Donnelly. The day passed in a flash, we were running around daft in our matching outfits, which were mercifully very positively received, and I am thrilled to report that apart from a few minor microphone issues the day went completely smoothly. Our wonderful speakers, minus the lovely Helena Britt, from L-R: Dr. Robyne Erica Calvert, Emily Malcom, Dr. David Mitchell, Dr. Peter Burman, Max Donnelly, Dr. Sally Rush, Ian Gow, Prof. John Hume. Image taken by Teresa Dickson at Glance, Observe, Capture Photography. Image copyright of Glasgow City Heritage Trust. We had confirmed that Sir Angus Grossart would be saying the closing remarks at our conference, but he was unfortunately detained and couldn’t make it, so the truly kind genius that is Prof. John Hume, Patron of the Glasgow City Heritage Trust stepped into the breech and said some very lovely and complimentary things about the superb quality of all of our speakers, and ourselves, he said, and I quote, “This is the best organised conference I have ever been to.” Coming from Prof. Hume, a man who does not say things lightly, and who has been working in the heritage industry for so many years, this made Karen and myself wonder what font this quote would look good in, tattooed on our persons. But really, it was a pleasure to see so many happy faces at the end of the day, the surroundings of Cottiers was a huge hit with attendees and speakers alike, and the successful discussion section at the end of the day proved very fruitful, with attendees and speakers engaging in discussions about the issues the heritage industry in Scotland will face going forward, as well as what we could and should “save”. 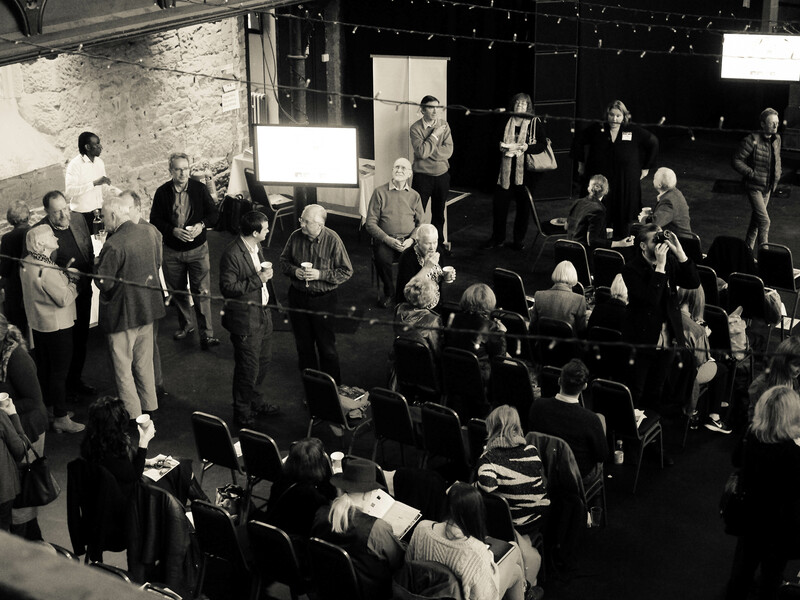 Lastly we need to thank the grafters, the Gilded Age Team; David Robertson and Fergus Sutherland our fellow organisers, Shirley Lochhead our talented designer, Teresa Dickson our photographer, Mike Rea our film-maker, and Joe Sutherland who designed the fab Gilded Age Website. Thank you also to Torsten the Director, and Maggie our Office Manager at our workplace Glasgow City Heritage Trust, the folks who gave this project the go ahead! Finally, thank you so much to our very well behaved and enthusiastic attendees! Our wonderful attendees doing some networking! Image taken by Teresa Dickson at Glance, Observe, Capture Photography. Image copyright of Glasgow City Heritage Trust. Previous Post Conference hailed a success!